Of all the developmental leaps and milestones, I have to admit, the one I was looking forward to the most was the onset of your creative and imaginative play. You know, where your little toy characters have conversations, you spend hours making pretend meals, and all where matter of critters and friends exist solely in your mind. I love listening to your squeaky little voice as you act out the drama of your toys; it makes me smile knowing you are developing a complex part of your brain. I had no idea, however, that with the growth of your imagination there would come the degradation of my sanity. I consider myself to be a fairly creative person. When I was little I had a rich imaginary world, and since I spend so much of my waking hours with children of varying ages, I still have a bit child-like behavior left in me, and I can play pretend with the best of 'em. But your little imagination occasionally has me stumped and grappling with the thought that these pretend things actually DO exist, I simply cannot see them, and I am going to go insane looking for them and trying to understand how you and I can communicate and coexist peaceably. The other day, you came running down the stairs all in a tizzy. It was after nap (so you were well rested and not in a sleep-deprived-hallucinating state, but then again, maybe you were still dreaming? ), and you had been playing in your room for about half an hour. (Can people sleepwalk for half an hour? Probably not. There goes that theory.) Your little feet came thudding down the stairs at a hundred miles per hour and you were hollering something about your keys missing. I went upstairs with you, and we proceeded to tear your room apart looking for your keys. Your Papa Davis had given you a set that he no longer used for you to play with, so I figured this was what we were searching for. I managed to find those keys, but no. You rather loudly proclaimed, "Not that keys!!" and started a bout of fake crying. (By the way, that little trick can end ANY day now.) Not aware of any other set of keys in your possession, I continued to search. We looked upstairs. We looked downstairs. We looked in Mommy and Daddy's room. We even looked in the garage. Finally I suggested we get a drink of juice and take a break and think about it. You agreed, and we went to the fridge. When I opened the door, you SHRIEKED! "There they are Mommy!!!" I am looking all over the fridge, and I see no keys. You reach in and pluck an imaginary set out of the produce drawer. "You didn't find them, Mommy. I find them," you proudly proclaimed. Well DUH, son!! I had no idea that the keys in question were in fact INVISIBLE! I feel like that little bit of information would have been a tiny bit helpful. Anyhoo. Keys were found, you got juice and life went back to normal. Or as normal as it could be with a person that hallucinates missing keys hiding in refrigerator drawers. We were in the living room, and I was talking to you about what you wanted to have for snack. You said you weren't hungry, so I let you be for a minute, and I went back to playing on the internet paying attention to world events. A little bit later, I heard you in the kitchen, so I went to investigate. You were reaching in the drawer that houses the Ziploc bags, so I asked what was up. You said, "I need a ziptop (your way of saying Ziploc; so cute!) 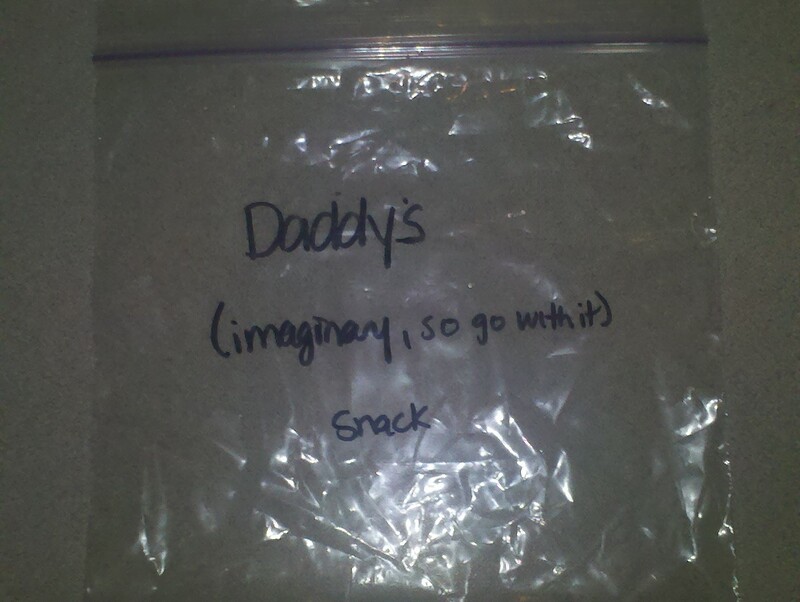 for Daddy's snack." I looked around and didn't see anything, so I asked the obvious question, "What snack?" "This snack," you responded. I see nothing. Just you and me and our usual kitchen clutter. I mention something about not seeing any snack, but you are adamant. Finally I decided that sometimes you just have to pick your battles, and I gave you a flippin' Ziploc. I watched as you painstakingly opened your bag and placed inside: an imaginary snack. You were so careful and cute not to "spill" any of your snack for Daddy. And you kept telling me that Daddy had to eat it. 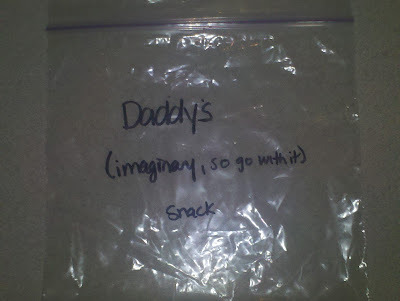 Well, I was going to Cairo that night to teach twirling, so I labeled Daddy's snack for you and hung it on the fridge. When Miss Kallie, your baby sitter came, I made sure she was aware of the snack-on-the-fridge situation, and you were so proud of it. I had to take a picture. Thankfully you can't read (yet) so I was able to give Daddy a little help with this snack situation, since he was going to be blindsided with it as soon as he got home. I can only imagine what it would have been like if I hadn't left the clue that it was imaginary. I had already been through that hoop of craziness, and I wanted to save Daddy the trouble. Although, maybe I shouldn't have - that way we both could have felt like we were going nuts.